This glass top sofa table creates a functional but light and contemporary living room accent piece. Structure your living around these sleek and simple metal and glass tables, with crossing leg supports. Pair this sofa table with the coordinating end and cocktail tables to complete the look. The Nova Glass Top Sofa Table by Steve Silver at Walker's Furniture in the Spokane, Kennewick, Tri-Cities, Wenatchee, Coeur D’Alene, Yakima, Walla Walla, Umatilla, Moses Lake area. Product availability may vary. Contact us for the most current availability on this product. 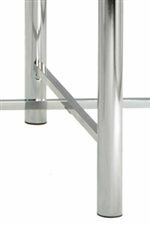 NV100SB Sofa Table Base 1 30"
NV100ST Sofa Table Glass Top 1 48" 18"
Case Detail Straight lines, geometric edges, metal tube legs, and crossed metal support bases. Case Construction Tubular burnished metal frames. Contemporary styling defines this unique group of shiny metal accents which outfit your living room with fresh accent pieces in your home.Tubular metal frames with crossing supports, and raised beveled glass tops make for a light and airy ambiance, but maintain a sturdy and functional use in your living room and in your home. The Nova collection is a great option if you are looking for Contemporary furniture in the Spokane, Kennewick, Tri-Cities, Wenatchee, Coeur D’Alene, Yakima, Walla Walla, Umatilla, Moses Lake area. Browse other items in the Nova collection from Walker's Furniture in the Spokane, Kennewick, Tri-Cities, Wenatchee, Coeur D’Alene, Yakima, Walla Walla, Umatilla, Moses Lake area.